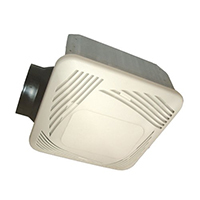 The 60 CFM USI Bath exhaust fan is designed in a decorative style to match any decor. It covers as much as 80 square feet of living space, providing powerful ventilation. The fan provides this benefit while working to pull moisture out of the air. This exhaust fan runs at 1.4 sones. The motor has been permanently lubricated. It comes with a 4-inch and 6-inch duct adapter, and allows the bathroom to maintain normal levels of humidity and keep odors, mildew, and mold from entering the space. The fan features heavy-duty housing that is also moisture-proof.